Shopping, to me, is a dreaded, stressful experience. I don’t know what I want, and I feel overwhelmed by choices. But I can’t help but look at the girls around me that are my age. They have these stylish outfits that seem well thought out yet simple. They have nice purses, and their hair falls just right, either straight or in perfect waves. How do they do this?! I don’t have the time or the patience to pull myself together. On top of that, I’ve chosen a career in which I get to wear scrubs. So my style has gotten increasingly lazy over the years. 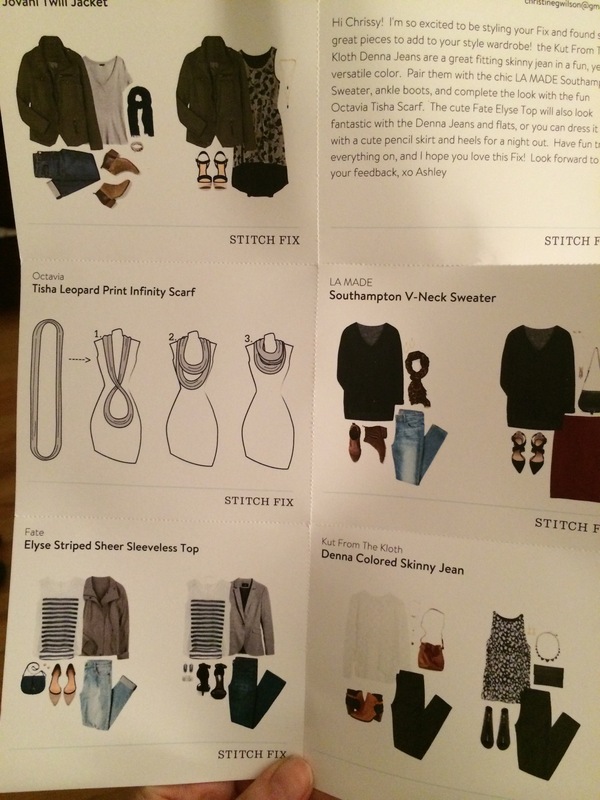 However, back in October I found Stitch Fix. It’s a personal shopping service for women. I signed up for the every other month deal, and I filled out a lengthy profile that went over everything from my size, what I like to show off, different styles I like, and how much money I’m willing to spend. So every other month, a personal stylist sends me five pieces that they think I will like. This month’s box. The stylist sends these cards showing fashion-incompetent me how to wear each piece. I am only charged a $20 styling fee. I send back whatever I don’t like, and I keep the pieces that work. They charge my credit card for what I keep (deducting the styling fee), and I have new pieces of clothing. This has been AMAZING for someone like me. I’ve been able to build up a better wardrobe. With each box, I write a review back to my stylist of why I did or did not like certain pieces. So each box (in theory) gets better than the one before. With my most recent box, I ended up keeping all five items which resulted in a 25% discount off the whole thing. 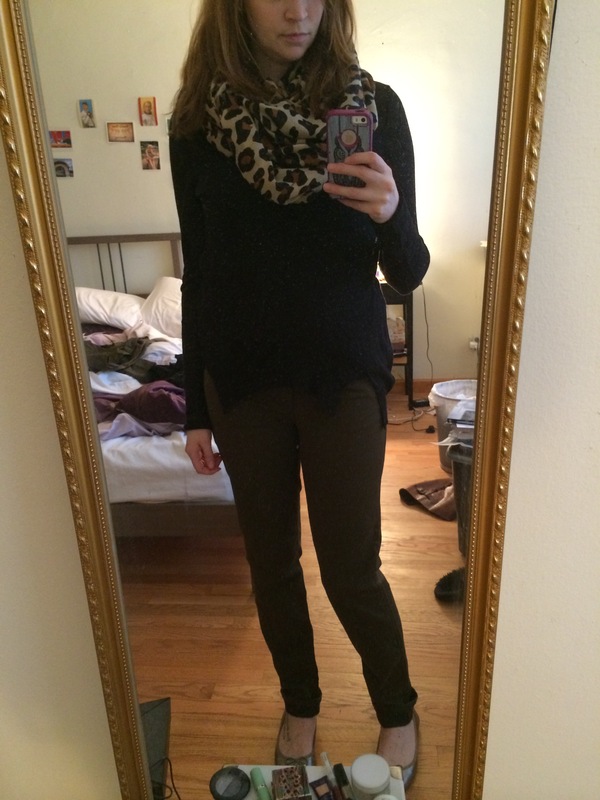 This for instance shows the leopard print infinity scarf, the black sweater and the army green skinny jeans. I never thought I’d like anything leopard print, but I gave it a shot and was immediately enamored. I had no idea it would go so well with my plethora of black clothes. The black sweater was simple, but it has beautiful detailing and an almost sheer, lace quality to it. Pants that aren’t jeans? A revelation. I also have a pair of burgundy skinny jeans from a previous box. I also like that each piece comes from independent clothing companies. So I’m not throwing my money to Gap and Urban Outfitters anymore. The striped blouse is from Fate. The jacket that I plan to wear every glorious day of Spring is from Latte. 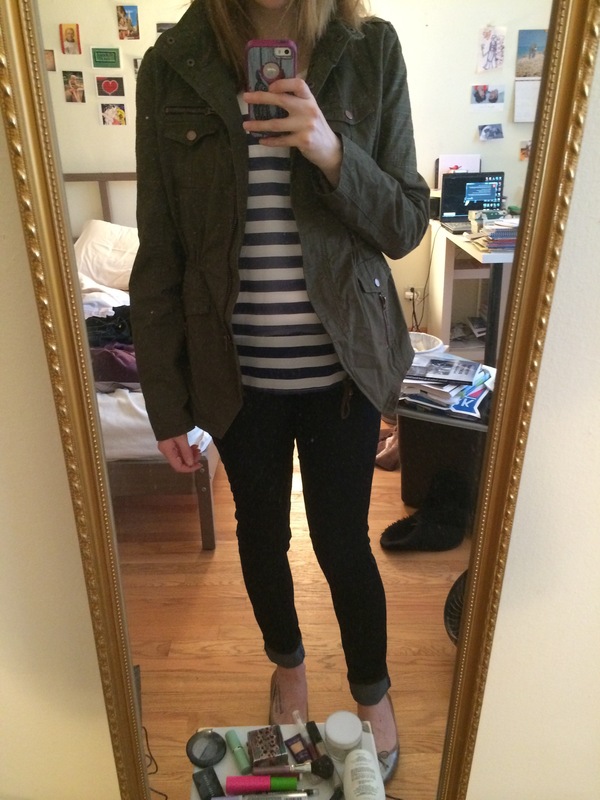 And the skinny jeans in the picture are Mavi and are from a previous Stitch Fix box. They fit like a second skin. I debated whether I should mention that this is not a sponsored post, because HA! this is nowhere near being anything close to a fashion blog. I just can’t help preaching the good word of Stitch Fix to the likewise fashion-illiterate people out there. It’s honestly been the easiest means of looking put-together I have ever found. Feel free to use my referral code. For men, I think there’s a male version of it called Trunk Club. But all of my guy friends who have looked into it have told me that it’s dreadfully expensive. That’s such a good idea. You look so stylish! I also use Stitch Fix! Such a great idea, and I keep telling my family back home I wish there was such a thing in Aus!